A few years ago Amsterdam became an attraction richer: the A’DAM Lookout Tower. 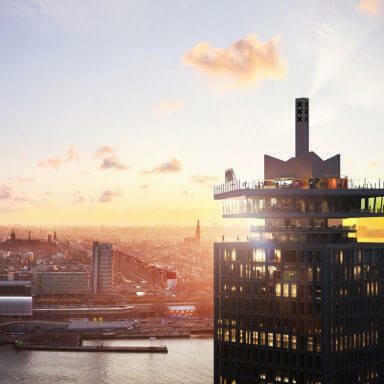 Shell’s former headquarters in Amsterdam Noord have been transformed into a major hotspot, offering the most incredible views over the city. Every floor offers a different activity. Having heard a lot of good things about this location, I decided it was time to check out the A’DAM Lookout tower for myself. Even getting there was fun, using the free ferry which leaves from behind Centraal Station. Upon arrival, I got into the spectacular lift (20 floors in 22 seconds) and headed for the roof where Europe’s highest swings can be found. This tower attraction is called Over the Edge. It’s a breathtaking and fantastic experience! My pulse raced as I flew back and forth over the edge of the tower, 100 metres high, admiring the view across the most beautiful city in the world. Who could ask for more? Although extremely safe, these swings are not suitable for children under 1.3 metres. The only disappointing feature was that you have to buy a separate ticket at the location. Entrance to the tower in itself is not cheap, and it would have been great if the Over The Edge experience would be included in the price. Stunning views over the city from the A’DAM Lookout tower. The highest swings in Europe! Anyone who appreciates incredible views but prefers to keep both feet planted firmly on the ground can enjoy the 360° rooftop panorama deck. You don’t need a swing to enjoy the stunning spectacle of cityscape and canals spread out before you. Dare to take your place on Europe’s highest swing, or prefer to enjoy the view from the panorama deck? You definitely won’t be the first! Avoid the queues and buy your tower tickets online. Please be aware that swing tickets will need to be purchased at the location itself. As well as the swings and panorama deck, A’DAM Lookout also offers you another unique hotspot. The Moon restaurant is located on the 19th floor, rotating 360° as you enjoy your lunch or dinner. Moon serves classic dishes with a modern twist to accompany the forever-changing views over the beautiful city of Amsterdam. In my opinion, this is the perfect way to end your sky-high swing and rooftop panorama experience at A’DAM Lookout. 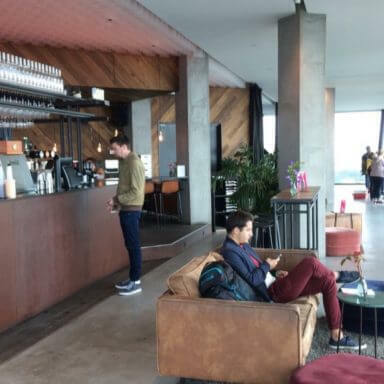 All of the catering facilities located within the Lookout Tower offer amazing views over Amsterdam! Would you rather sit back and watch the city with a delicious cocktail in your hand? Panorama restaurant Madam is “the place to be”. This bar is located at the top of the tower, changing – together with the view – into a contemporary skybar as the sun sets behind the city. 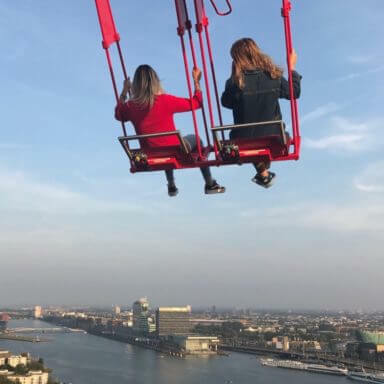 As well as the swings, the bars and the restaurants, the A’DAM Lookout Tower also houses an interactive exhibition which focuses upon Amsterdam’s history and culture. You can also take photos as you ‘balance’ on the building’s edge. My tip: Plan your visit to coincide with the sunset! The view from the rooftop panorama deck is best as the sun goes down. Watch from an incredible height how the city slowly creeps under it’s blanket of deep blue. This is one of the most popular visiting times, so make sure you arrive in plenty of time. Combine your visit with a drink at one of the many bars to end the ultimate romantic evening out! The A’DAM Lookout Tower is located at: Overhoeksplein 5, 1031 KS Amsterdam. As I have already mentioned, A’DAM Lookout is easy to reach using the public transport system. From Centraal Station, it only takes a few minutes to arrive by way of the free shuttle ferry which leaves from the Buiksloterweg. Prefer to drive? No problem. The tower has its own parking facilities at competitive prices, where you can park 24 hours a day. Buy your A’DAM Lookout Tower entrance ticket online and step right in! Swing tickets can only be purchased at the location itself. A bird’s eye view you shouldn’t miss. 639 visitors rated A’DAM Lookout Tower average 4.55 stars out of 5.